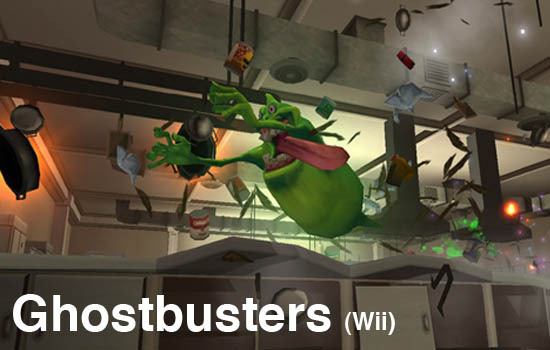 By allowing a complete re imaging for the Wii release of a game, Atari did something much different with Ghostsbusters than what we normally see with games. Co-optimus.com was interested to see what those differences were between the Ghostbusters releases from a co-op specific point of view. Since we've already reviewed the Xbox 360 and PS3 versions of Ghostbusters, all that was left was the radically different looking and controlling Wii version. 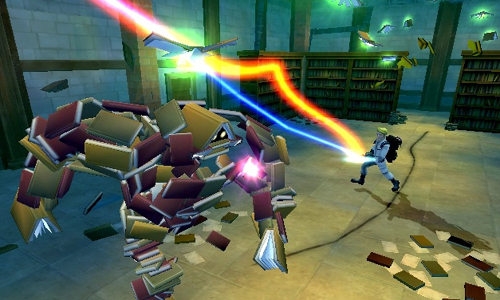 Does Ghostbusters on the Wii do co-op as well as the Xbox 360 version, or perhaps, even better? Ghostbusters on the Wii was not developed by Xbox 360 or PS3 developer Terminal Reality, but by the relative newcomer, Red Fly Studios. I point this out because Red Fly was responsible for one of the most original Wii games of last year, called Mushroom Men. They have the Wii down to an art, and they poured every bit of their experience and talent into Ghostbusters. To begin with, you are an ambiguous rookie Ghostbuster hired to test all of the untested, unstable equipment that will be used by the original four Ghostbusters to win the day. Just in the nick of time, too. New York is in danger as all of the old ghosts come back to haunt familiar locations from the original Ghostbusters films. Familiar faces such as Mr. Staypuft will be test subjects for your new toys, and names like Gozor will perk up the ears of any fan of the series. The story and dialog is identical across all versions of the game, so if you've played one version you know exactly what's happening. Artistically the game has more of a stylized cartoon feel to it without betraying the original image of the characters or ghosts. This style is done in such a way that kids and adults will both enjoy, perfect for the Wii console itself. Your character can be male or female, and your co-op partner through the story will be the opposite. This brings us to the biggest difference (to us) between the games. Once you begin the story, you are asked if you'd like to be joined by a second player. This differs from the Xbox 360 and Playstation 3 versions of the game, since the entire storyline is playable in co-op. With the Wii, additional challenges are presented in gameplay and restrictions arise as well. Red Fly ain't afraid of no challenge, and they make great use of the Wii remote motion controls while wrangling ghosts. Capturing ghosts with your Wii remote is made simple and effective with the use of auto-targetting, giving you a focus point for aiming at ghosts. You'll hold on to your target ghost, and smash them around the destructible environments by swinging the Wii Remote in one direction or another. After you've beat the pesky ghost into submission, use your Wii nunchuck to toss out the ghost trap in an almost-realistic action. The story itself focuses around a new "Gozor" exhibit that was donated to the museum, which has triggered a wave of supernatural disturbances, including reemerging ghosts, and an onslaught of more enemies than the Ghostbusters have ever faced before. There are some areas of the game that are semi-hidden, but have more enemies in a small space than when you see the same area in the single player mode. This co-op specific feel makes the game much more chaotic and enjoyable. Stantz: "Nice work! Kid, you're a natural." Venkman: "Yes, you've done a substantial amount of damage to a 5 star New York hotel. Your mother and I are so proud!" Ghostbusters Ain't Afraid of No Co-op! Ghostbusters Wii Slimer Edition on Sale Right Now for $38! Page created in 0.2677 seconds.